L - Deep brown color with a dark brown head. S - Roasted malts and chocolate. T - Rich flavor that adds onto the smell with vanilla and smoky flavors. Also seems to be a bit of dark fruit and hops that add a nice bitter taste. O - A great and hoppy porter. Pours deep brown, with a big foamy light tan head. The head has very good retention aided by solid steady carbonation. The aroma is a little light, more caramel and a hint of hops and grain with no chocolate. The taste is almost like a schwarzbier, but with a little more caramel to balance the roasted malt flavor. The body is lighter and the carbonation is pretty strong throughout. I like porters. This one's distinct; I described it to my brother as "very smooth going down with a bit of a hard landing." The finish is dry and unlike some porters and many stouts, the coffee is held in check and not allowed to dominate over the malt, barley and chocolate; it's well balanced. Now, I was drinking a fair amount of Deschutes Black Butte Porter because, based on my taste, I considered it the best of the porters I've tried. However, this one is right up there with the Deschutes and it may have even a little more body. I'm having to make room for more bottles. A: Poured from a bottle to a pint glass. Had a dark brown color and a mostly thick consistency. there was a half inch of creamy, tan-colored, fairly long-lasting head. Good lacing. S: A nice aroma of coffee, malt, and a tinge of hops. 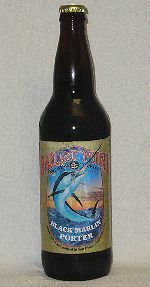 T: Tasted of coffee, roasted malt, and hints of caramel and hops in the finish. A well-rounded flavor. M: A good amount of carbonation with a very dry finish. Medium-bodied. D: A solidly drinkable American Porter. Feel: medium mouthfeel, medium amount of carbonation. Overall: a good example of an American Porter, with lots of great coffee and chocolate flavors. A- Black marlin is not quite all the wayt there as the color is more of a very dirty and dark brown. Not much of a head on this just some scattered foam on the surface, no lacing. S- Smells like a porter with roasted malts and some caramel with it. Some mollasses and some hops in the distance, not this beers main focus. Some chocolate and cocco, not much coffee. T- A very tasty porter here, one of the better ones ive had recently. Robust roasted malts giving off some chocolate and a bit more coffee than smell. Molasses are a great touch. Also getting some vanilla in here which is always welcome. M- A creamy and medium mouthfeel with a low amount of carbonation. Just a bit of a watery feel towards the end of the gulp. D- A bit above a session beer and I could of drank more. This one is now on my radar for a bottle purchase to compare. Not mindblowing, but solid. Squid-ink black body; dense, very thick, dull bone colored head. Charred grain aroma; coffee beans; bitter, dark chocolate. Dark roasted grains; carob; mocha and cream; subtle, bitter edge; mild tanginess. Heavy body, smooth and silky mouthfeel; creamy; semi-sweet finish. Bottle from - I believe - Wine Gourmet in Roanoke, VA. Picked this up on my one trip to Roanoke ever, when I took the VA Bar Exam. Poured in to a 14 oz. cervoise. Appearance: Pours a translucent brown, dark enough to let little light escape, but light enough to let a few rays through around the edges. The one finger of tanned head fades rather quickly (strike one) and leaves very little if any lacing (strike two), only a thin, delicate, and spongy collar. Occasional stray bubbles - medium sized - streak to the surface ever so often, visible around the periphery of the vessel. Aroma: An odd fruity aroma - imparted by the yeast, no doubt - emerges first, likely because it's the lightest. It's faintly reminiscent of berries, high and estery, slightly strawberry-esque. The remainder is standard porter notes, slightly on the earthy side, with tons of dirt, toast, slight sweet notes, sweet cocoa, and a few faint astringencies. Taste: Similar to the nose, in many ways. Dark, bitter cocoa, earthy coffee, dark toffee, faint caramel, toast, earth, dirt, char, perhaps a faint kiss of smoke, and a faint underlying hop bitterness ... to give it all in one adjectivial eruption. It's solid, though, fairly well balanced, and - though perhaps a little earthier on the whole than I'd like - a tasty brew. Mouthfeel: Odd, as it's thick enough to where you imagine it would be more even than it in actuality is, given how much carbonation is present in the mix here. The result is a slightly uneven, eruptive, turbulent mouth. Ok, so turbulent isn't quite the right word, but it's a little less even than I'd like, all things considered. Drinkability: An above average beer from a brewery that typically provides above average offerings (and some truly stellar offerings). This is a porter that's characterized by a lot of earth and a few strange yeast contributions that - thought unique - may perhaps be off putting to some. It's definitely worth a try however (especially at a mere 6.0% abv), though I don't see it becoming part of my repertoire. 22 oz bomber, best before date of 08/02/12, poured into a snifter. A- Pours black with an inch of creamy beige head, nice retention and a bit of spotty lacing. S- Nice roasty aroma of charred grain and a bit of coffee, also has a dimension of sweetness that provides notes of chocolate and currant. T- Big roasted flavor, big flavors of char and dark coffee beans, has a nice amount of chocolatey, fruity sweetness. Towards the finish a bit of hop bitterness becomes more apparent. Roasted bitterness and a bit of cholate lingers into the finish. M- Medium-bodied, smooth feel, a bit creamy. O- A nice porter, it's heavy on the roast which I'm personally a fan of, very tasty and drinkable. A: Almost black with some cola-brown highlights around the edges. A nice finger tall head, slightly offwhite - a bit surprising considering the darkness of the brew. T: Very much like the aroma - a pleasant malt roast and a chocolate powder. A bit of a burnt woody or nutty like taste, but it's not either - something, rather, that seems to come from the malts. M + D: Light on the carbonation, a decent sized body - not too thin. A touch of chewiness to it and a nod towards trying to finish dry, but perhaps falling just short. While it may not have knocked me off my feet, I find this to be a particularly nice porter, and could see myself having this around from time to time. Had at home while watching a game. A - Dark brown in color, with a mocha head, and dissipates slow. S/T - Chocolate and light roast coffee, with some bittering hops. M - Creamy, rich, full bodied, and malt dominated. D - Very good. This would be my ideal attempt at homebrewing a porter. A: Pitch black in the glass with a well developing mocha colored head that was frothy with cavenous voids on the surface. Retention was good as well the lacing leaving thin stratified rings. S: The nose was a bit of a disappointment. Very light of dry roastediness, finely grounded grains with a bit of generic coffee. A touch of dark fruit upon agitation but otherwise very light and leaves little anticipation leading into the flavor. T: Dark roast, freshly ground coffee mixes with a sweet caramel malting that redeems itself from the lackluster nose. Dark plums with a roasty bitterness and sweet speciality grains blends well together. The bitterness is fresh and wet, especially noted on the finish of wet coffee grounds and roasted barley. Lovely and easy but very fulfilling. M: The mouthful was light to medium, roasty with a decent level of carbonation coming about around the tongues edges. Oily texture with a roasted bitterness of wet coffee beans grace the finish. D: Good deal of flavor and roastediness packed into a 6.0%abv package. Drinks bigger and fuller then expected. Not necessarily the drinkability of a table porter as noted on the label but ill trade it for a bigger and fuller experience with less volume anytime. A bomber sits about right.